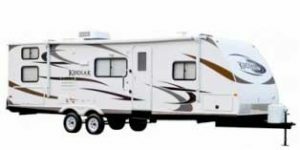 "Great Blue Heron RV...Travel Trailer & Camper Rentals for Summer 2019"
We are booking for Summer 2019 starting February 1st. Contact us early for best availability on dates and models you like best. Our office hours are 8:00 a.m. to 12:00 p.m. until June 1st. Please email or leave us a voicemail, we will get back to you as soon as possible. Live large and tow small! 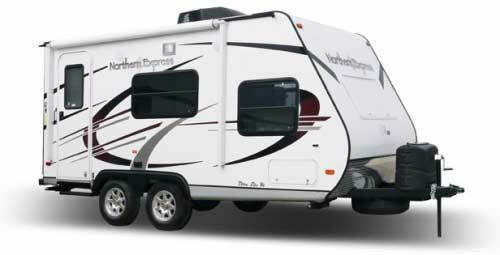 With this great RV rental you can enjoy the ease of towing a smaller trailer and also the amenities and interior space of a larger trailer. Sleeps up to eight people and has a dry weight of only 3,270lbs. A hybrid camper with lots of space for living and sleeping up to 8 people. 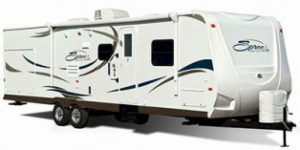 Has three tip-out Queen beds, full bathroom, full kitchen, A/C, furnace, hot water, power awning. 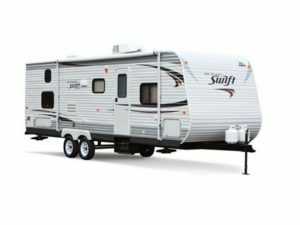 Lightweight for easy towing with all the comforts of home. Sleeps 8; Dry weight 3,678 lbs. We call it baby Grey Wolf because of it’s cute size and light weight. A great layout including double bed bunk with single on top, sofa bed, full kitchen and bathroom. 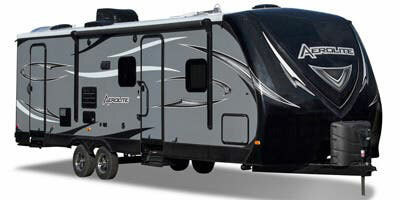 Also features power awning, rear bicycle rack, electric stabilizers & jack. Easy to tow and set up. Sleeps 6, Dry Weight 4,218 lbs. This travel trailer sleeps 4 and is light enough to be towed by most SUV’s. Packed full of comfort and amenities. Sleeps 4, Dry Weight 3,774 lbs. 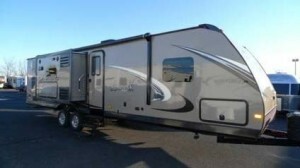 Luxury light weight travel trailer. Queen bedroom with Ever-pedic memory foam mattress, large u-shape dinette, electric fireplace, large full bathroom, power awning, furnace, A/C. Easy to tow, sleeps 4, Dry Weight 4,870 lbs. 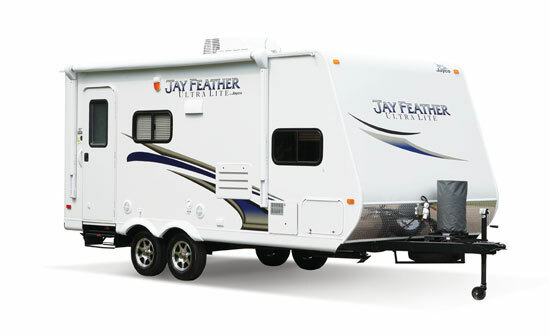 Go Light, Jayco’s Summit Edition model makes for a comfortable luxury retreat. Features two slide-out rooms, full kitchen with island, full bathroom, private queen bedroom with dual wardrobes, furnace, A/C and much more. Sleeps 4, Dry Weight: 5,051 lbs. 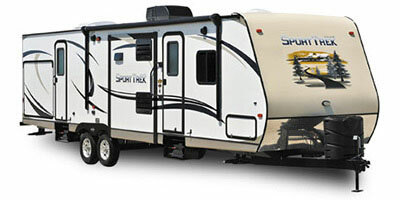 This Spree gives you the space and features you want without the concern of towing heavy weight. 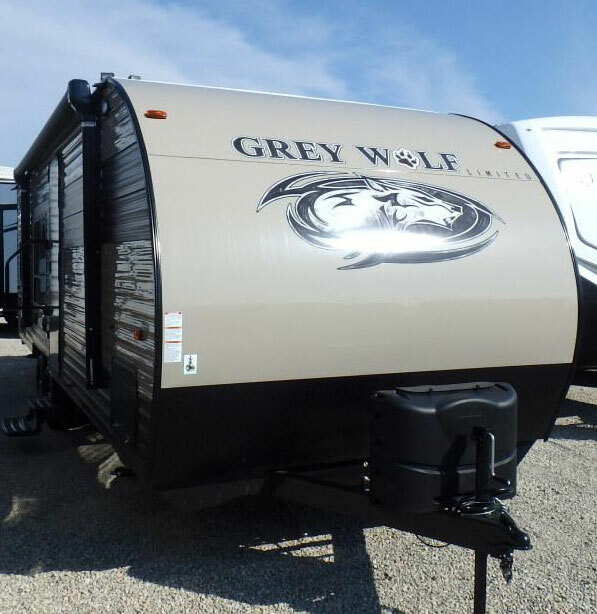 Features a large slide-out with U-shape dinette, walk-around queen bed and dual wardrobes, two rear bunk beds, full kitchen and bath and more. Sleeps 6, Dry Weight: 4,605 lbs. 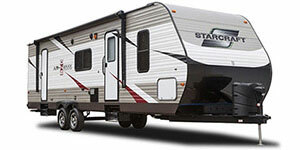 This Star Craft is a practical mid-size travel trailer with good floor plan and lots of beds! Great for family camping without towing heavy weight. Features queen bedroom with dual wardrobes, two double bed bunks at rear, jack knife sofa, booth dinette, full kitchen, full bathroom, furnace, A/C, hot water, entertainment center. Practical and comfortable for up to 6 people living on-the-road. 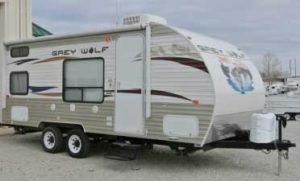 This trailer is lightweight for easy towing yet roomy and comfortable inside with lots of beds and amenities. 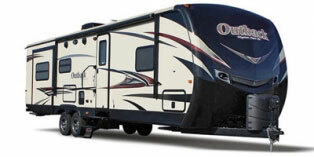 Features queen bed with privacy curtains, rear bunks, sofa bed, booth dinette, TV/stereo, full kitchen. Great for family trips and easy on your vehicle. Sleeps 6; dry weight 4,352lbs. 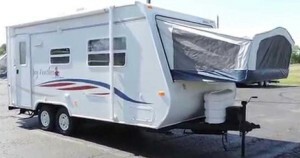 A great trailer for family trips. 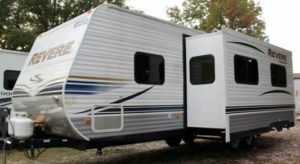 Features a large slide out room, queen bedroom, two single bed bunks, sofa bed, entertainment centre and outside kitchen. Sleeps 8; Dry Weight: 5,990 lbs. 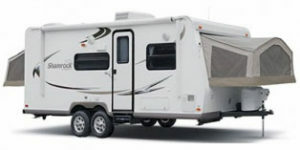 Perfect lightweight camper that can easily accommodate the entire family. Master bedroom with queen bed at the front and two double bed bunks at the rear sleeps up to 8 people comfortably. 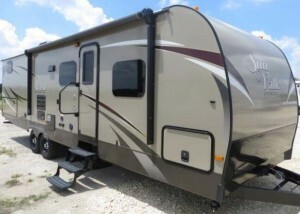 This camper is the perfect balance in “kid friendly” and “luxury”. Sleeps up to 8 with Jack & Jill bunks, private front bedroom and large slide-out room. 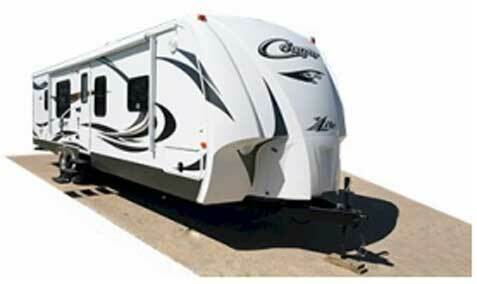 Easy tow and set up with electric awning, power tongue jack and electric stabilizers. 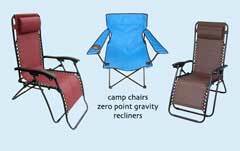 Just the right features to make camping a breeze! 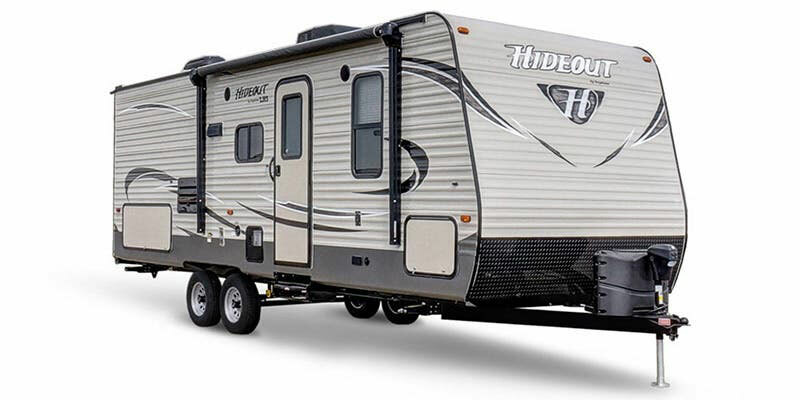 Plenty of space for family and friends in the Hideout 272LHS. Front queen bedroom and double bed bunks at rear. Spacious slide out room with sofa and dinette. Enjoy all the camping conveniences with this lightweight travel trailer. 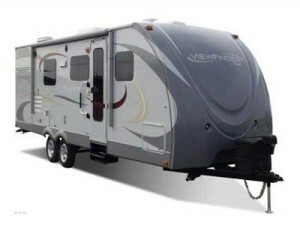 Enjoy camping in this comfortable and well equipped travel trailer. Features include large slide-out room, private queen bedroom, double bed bunks, outdoor kitchen, power awning and LED lighting. Lots of living room and storage spaces. Light weight for easy towing Sleeps 8; Dry Weight: 6,000 lbs. The Kodiak 284BH is a great lightweight way to travel. Fantastic floorpan with front queen bedroom, large slide out and two rear single bunks. Sleeps 7, dry weight 5,708 lbs. 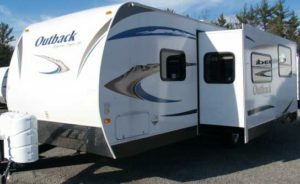 This ultra-life bunkhouse travel trailer features a walk-around king bed with two 42” rear bunks, and an additional 28” bunk. Fantastic outside kitchen. 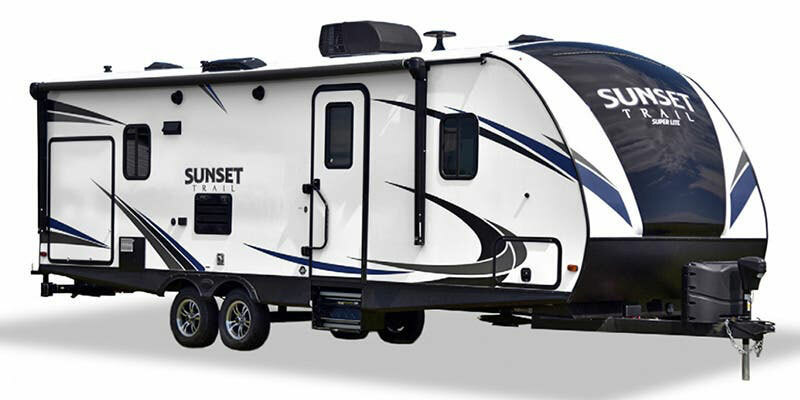 This ultra sharp Sunset Trail weighs only 5,318 lbs and comfortable sleeps 8 people. Great bunkhouse floorpan is loaded with great features including an outside kitchen. This Cougar is an ideal family camper. Features a private queen bedroom, 3 bunk beds in the rear, large slide-out room, full bathroom, full kitchen, and an outdoor kitchen too. 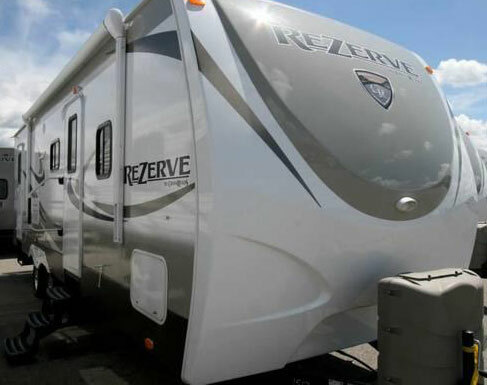 Camping will be easy and fun in the Reserve 28BH. Features a walk-around queen bed and rear bunks along with all the amenities to make camping simple. 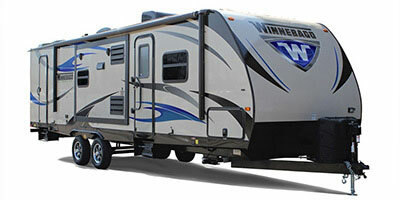 This Winnebago is true luxury living space for up to 7 people. Features wide dual opposing slide-out rooms for lots of living space like home! Full kitchen and bathroom, private queen bedroom with solid privacy door; double bed bunks at rear and lots of windows to enjoy your camping environment. Sleeps 7, Dry Weight: 6,740 lbs. This travel trailer takes comfort to a whole new level! Full queen bed in front, double-over-double bunks at the rear, it sleeps well up to 8 people with two entry/exit doors, rear corner bathroom, outdoor kitchen and more. 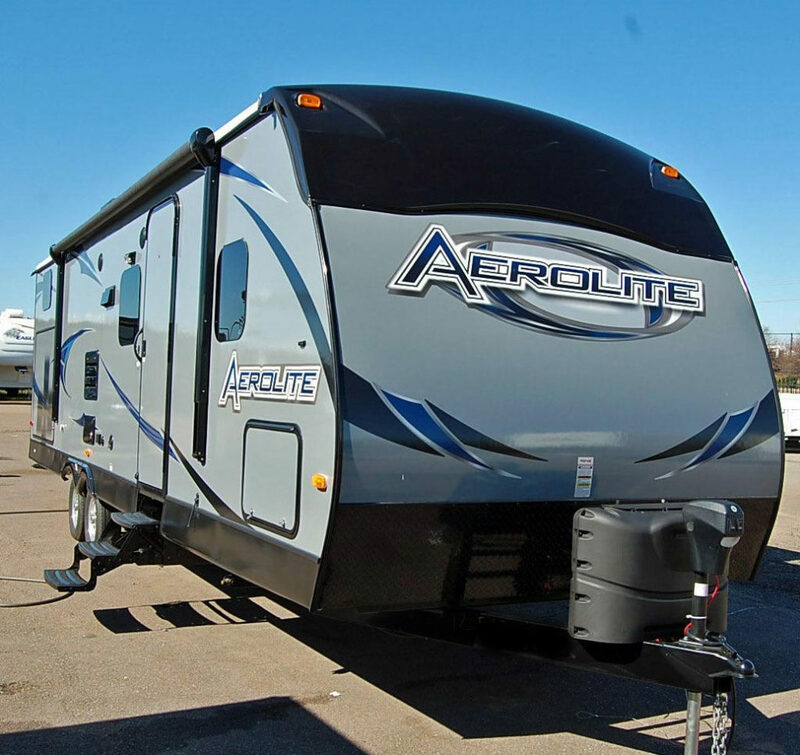 Prepare to camp in comfort in the Aerolite 315BHSS travel trailer. Large slide out room and mega sofa. Lots of sleeping space with triple bunk layout at rear, and front king sized bedroom. 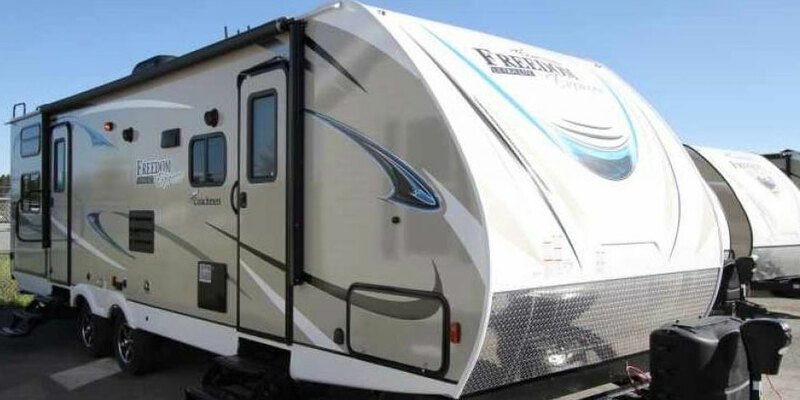 Enjoy camping in this beautiful high end trailer that sleeps up to 9 people. A great layout with three rear bunks, a large slide room, a private queen bedroom and a large outdoor kitchen! Easy to tow with dry weight only 6,052 lbs. 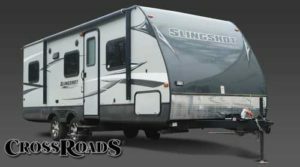 This travel trailer is roomy and loaded with great features like electric power awning, exterior shower, outdoor kitchen and speakers. Private queen bedroom and 4-bunk room at rear. Half-ton towable. Sleeps 8; Dry Weight: 6,450 lbs. This travel trailer is true luxury living on-the-road! Features a large slide-out room, dual entry doors, private queen bedroom with power bed and dual wardrobes, rear bunk house with slide-out room and large sofa sleeper, full kitchen and lots of storage cabinets and an outdoor kitchen too. Sleeps 10, Dry Weight: 7,505 lbs.